Formations like this give Arches National Park in Utah its name. Fee free days are a great time to visit. 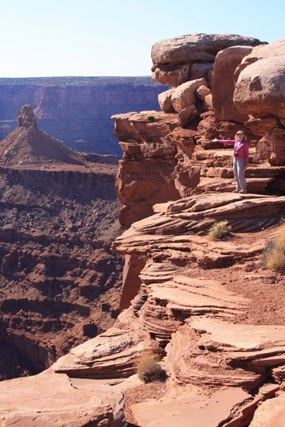 Southern Utah is one of the most outstanding geographical regions in our country. 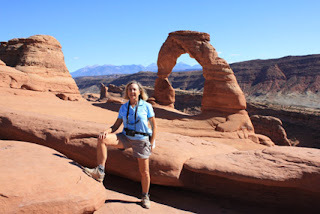 Stunning rock formations, powerful rivers and canyons, and beautiful historic locations are accessible in day trips from the bike and hike haven of Moab, Utah. Whether you love physical challenges or just enjoy stunning scenery, I urge you to discover one of our favorite destinations in the world. Park near Moab in southern Utah. 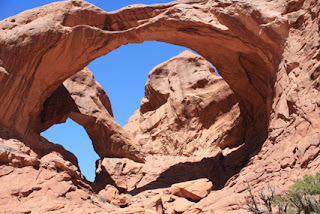 While Arches and Canyonlands National Parks are open year round, there’s no better time to visit than January 20, 2014, the first fee free day this year. Be sure to check times at the Visitor Centers, as these vary according to location. It’s early in the year, but that means temperatures for outdoor activities can be milder than during summer heat. There are plenty of trails to drive or walk in both parks, so whatever works for your fitness level you’ll have many Kodak moments to record and memories to share. A one-day visit can provide an overview of each park, but plan to stay longer, if possible, because there’s so much to admire. In addition to Martin Luther King Day, other fee free days noted by the park service include Presidents’ Day Weekend (February 15-17), the first weekend of National Park Week (April 19-20), National Park Service Birthday (August 25), National Public Lands Day (September 27), and Veterans Day (November 11). Don’t miss these opportunities to visit any national park without paying an entrance fee. Keep in mind that fees normally required for camping, tours, or special use permits and programs will still be required. 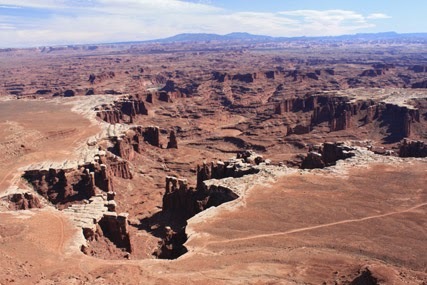 If you plan to hike the backcountry of the Canyonland districts, for example, contact Central Reservations in Moab or download backcountry use application form online and fax it in. Once you’ve reached the magic age of 62, you can purchase a Senior pass for $10, giving you lifetime access to all of America’s national parks. We’ve used ours for years, and it’s positively the best bargain in travel. For those not yet old enough, you can purchase America the Beautiful Annual Passes for $80 or the Southeast Utah Group Annual Pass for $25. That pass allows you to visit Arches and Canyonlands National Parks and Hovenweep and Bridges National Monuments any day for a year. Other parks offer similar discount passes. One pass per car is all you need. CanyonlandsNational Park in southern Utah. These parks are national treasures. Make a bucket list of those you haven’t visited and set about marking them off one by one. Fee free days are a great incentive to get started. What does a cruise really cost?